I know, I know. I should have posted an illustration, but I have a big meeting today, and I thought I'd better get some sleep. So, instead I'm sharing with you some photos I took today while I was working. From time to time at my job now I have to make what they call a mockup. Sometimes they're made out of paper, but more often, I need to make at least some part of the meeting sample real and tangible. When I have to make a real mockup, I need to leave the office and go out into the world. Most of the time I only go as far west as M&J Trimming (6th avenue), but today I knew I'd have to venture to - gasp! - the block of 38th street that looms between 7th and 8th avenues. That's right. The block of trim stores. Of course, there are more trim stores in New York than just on that block, but when I was in school and at my first job, I found that if there's a trim you need, you can usually find it on 38th street. More often than not, you'll find it at Pacific Trimmings, the one with the big YKK sign. 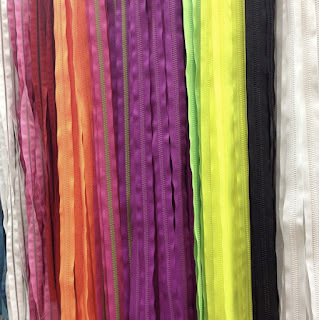 In any case, today I needed to make some DTM (fashion speak for "dyed to match") tassels for a paper scarf. (It had to be paper so we could show our own print in our own colors.) There were other things on my list, but I have to admit I was only successful in finding the yarns for the tassels. However, in my travels I did take a few photos I wanted to share. So, enjoy! 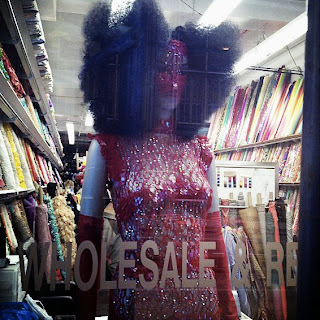 The first photo is typical of any fabric store in the garment center on the blocks between 7th and 8th. I love to see how creatively the window dressers fashion "dresses" out of large pieces of uncut fabric and trims. This one had a particularly spectacular mask/wig combo. Second, you'll see a couple of mannequins in the window of one of my favorite trim shops on 38th street. They make entire outfits for these ladies entirely out of the trims they offer in their store. 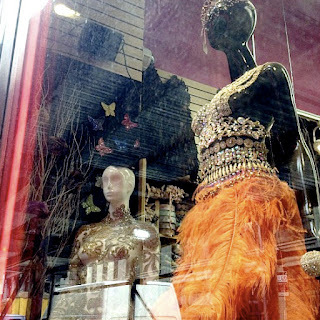 This particular store, though, does offer complete belly-dancing costumes as well, in case you ever find yourself in need. 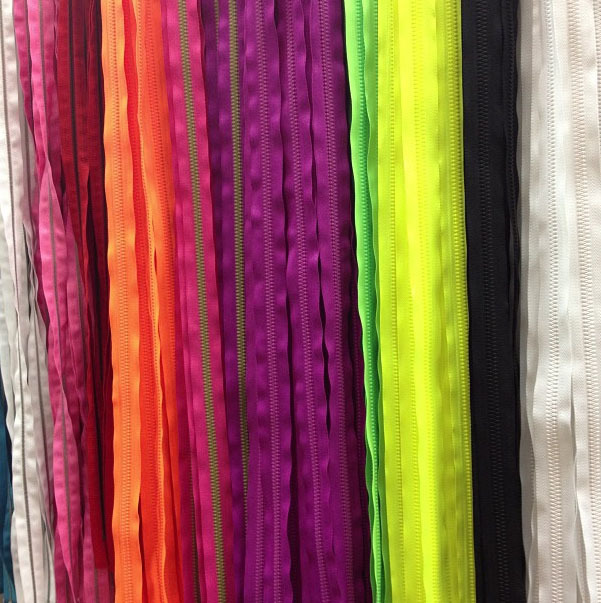 Lastly, you'll see a photo of a grouping of brightly-colored zippers at Pacific Trimming. This store is one of my all-time favorites in all of New York. It's not well-displayed, and you have to try pretty hard to flag someone down to help you, but if you need it, they've usually got it. Their button section alone is pretty overwhelming with its comprehensive holdings of non-novelty buttons. You never think you'd need that until you're just trying to put together a sample with some normal-looking buttons. Everywhere else has plenty of novelty, but this place has both, and plenty of sizes to boot. Anyway, I know this wasn't a particularly spinster-themed post, but I hope you'll forgive me. It is, however, indicative of a large part of this spinster's day.